I am sure everyone will be glad to read an email from the editor office beginning with ‘I am pleased to inform you that your manuscript is accepted for publication in *** journal’ instead of containing some words, such as ‘however’, or ‘unfortunately’. 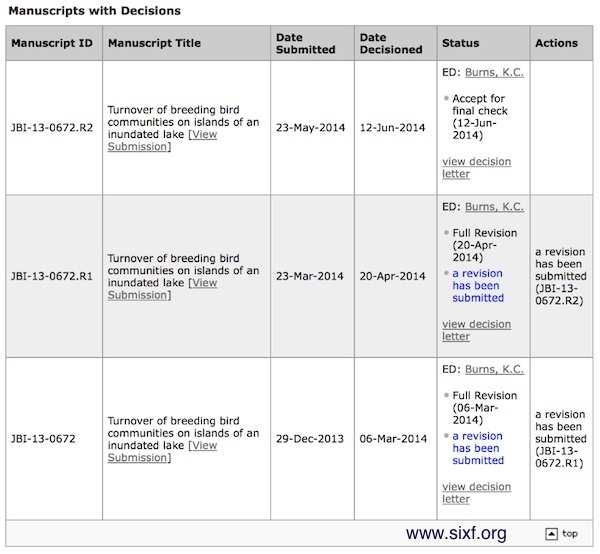 On June 13, 2014, I opened my email, and found the acceptance letter of our paper, Turnover of breeding bird communities on islands in an inundated lake, was sitting in my box – I was so excited! At that moment, I clearly remembered I began to prepare this manuscript in October, 2012 advised by Dr. Stuart Pimm at Nicholas School at Duke University. ‘Do some researches on turnover’, Stuart said, ‘we can test island biogeography theory with your bird data in Thousand Island Lake’. Stuart immediately lined up the main idea that was to test area, distance, target and rescue effects associated with turnover rates and incidence which was the extension of one of his previous studies off the islands of Britain and Ireland – Breeding birds on small islands: island biogeography or optimal foraging? published in 2006 in Journal of Animal Ecology. The leading author of that paper is Dr. Gareth Russell, a former Ph.D. student of Stuart, who was also invited to join our island research. In the first year (2012-2013), I read extensively on the literatures of turnover since 1967 – the year the classic book The Theory of Island Biogeography published. After that, I learned the methods in Russell et al.’ paper, and built the model for our island data in the first several months of 2013 with Gareth’s help. I then began to write the Results, Methods, Discussion and Introduction piece by piece in the reverse order advised by Stuart and Gareth simultaneously. Once I completed the first draft of our manuscript in April, 2013, I set it as FINAL version. Just one week later, I found I was completely wrong because each so-called ‘final version’ of the manuscript would be revised again and again with endless editing. Until in July, both Stuart and Gareth thought our manuscript was ready to submit, aiming to Journal of Animal Ecology. Unfortunately, I received the decision letter from the editor office after 52 days containing an annoying word ‘unfortunately’, indicating our manuscript was finally rejected after peer reviewed! It was a sad news, and I was depressed once again by the negative news because my another paper on camera trap was also rejected just one week ago. ‘Hanging in there!’ Stuart sent me an email fulled of encouragement, and told me that one of his most cited papers was also rejected at the first time, so just hanging in there, and revising the manuscript according to the reviewers’ comments. ‘Please bear in mind that these reviewers had helped you because they provided numerous good comments!’ I followed reviewers’ suggestions, and did improve my manuscript substantially. In the end of 2013, I submitted our ms to Journal of Biogeography, and hoped for a good luck. Sixty-nine days later, I got the decision letter as requiring Full Revision. Yes, this WAS a good news because the probability of our manuscript to be accepted was increased. After revised twice, our manuscript was finally accepted on June 13, 2014. Immediately, I shared this exciting news to my collaborators, and had a long exhalation because I can defense my degree in this fall. Looking back for the process of producing this paper, I completely understand it is not an easy job to publish your study in any prestigious journals. I have to admit that I was very lucky because I learned lots of academic skills from my collaborators which will be benefited to my future career. So, a big thank you to Stuart and Gareth again. Aim MacArthur and Wilson’s theory of island biogeography proposes that the rate at which species colonize an island depends on the island’s isolation (distance effect), whereas the local extinction rate depends on its area (area effect). Alternative hypotheses recognize that area can affect the colonization rate (target effect) and that isolation can affect the extinction rate (rescue effect) and, moreover, that these relationships may dominate. We quantify these relationships and associated turnover rates and incidence using long-term counts of breeding bird communities on islands in an inundated lake. Location Thousand Island Lake, China. Methods We assessed the occupancy and behaviour of breeding birds on 37 islands from 2007 to 2012. We estimated the effects of area, isolation and other biogeographical parameters on the frequencies of colonization and extinction events using multivariate logistic regression. We then extended these results to derived properties such as species turnover rates and incidence. Results Extinction rates decreased and colonization rates increased on larger islands. Isolation had no significant effect on colonization or extinction rates. Islands had high species turnover overall, and turnover rates followed the same pattern as extinction rates with different areas and isolations. Pool turnover, which controls for the number of species in the pool, was higher on large islands. Species richness also increased with area. Our study of bird communities supported area and target effects, but not distance and rescue effects. Main conclusions Island area was a better predictor of colonization and extinction than isolation, probably because of the relatively small scale (c. 580 km2) and homogeneous vegetation structure of our research system, and the strong dispersal ability of birds. We conclude that the differences between our observations and theoretical predictions, or results from other studies that measured colonization and extinction directly, are consistent with the particular biogeography of these islands.